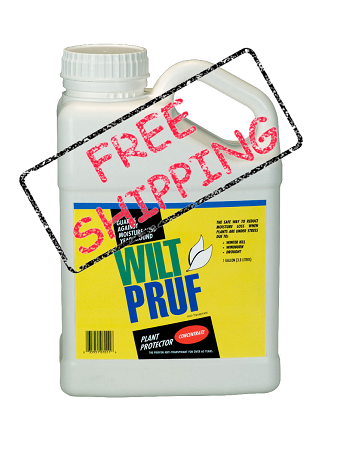 Wilt Pruf one-gallon concentrate with free shipping via USPS Priority Mail. We ship 6 days a week, this product is shipped within 24 hours of receipt of order except on Sundays. Typical delivery for Priority Mail is 2-3 days for mainland U.S.
Wilt Pruf concentrate is the perfect solution for protecting your home's plants and shrubbery all year long. A single gallon of the product makes from 5-10 gallons once diluted. The specially-formulated blend of chemicals works to keep Evergreens including Rhododendrons, Azaleas, Arborvitae, Hollies, Boxwoods and Laurels looking pristine when under high water stress by keeping moisture loss in foliage to a minimum. Usually ships in 24-48 hrs. via USPS Priority Mail. 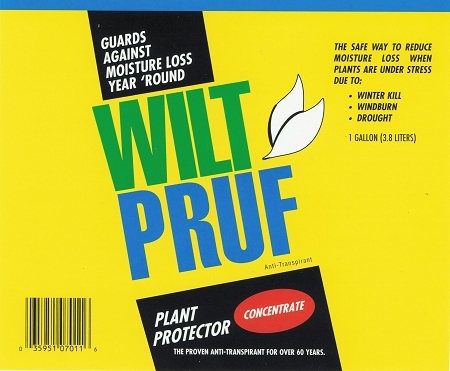 I have been using Wilt Pruf for many years. We recently moved to a new location and have a 35 bush rhododendron bed and several small Blue spruce trees on the Northwest side of the house. This is where we get the strongest and coldest winds during the winter. We remember a winter back about 15 years ago when we did not use Wilt Pruf at our previous location and lost several large rhododendron bushes due to a harsh winter. Never again. It works and works well! It is expensive, but not as expensive as replacing the bushes. The company shipped the product immediately and our plants are now ready to face the winter. 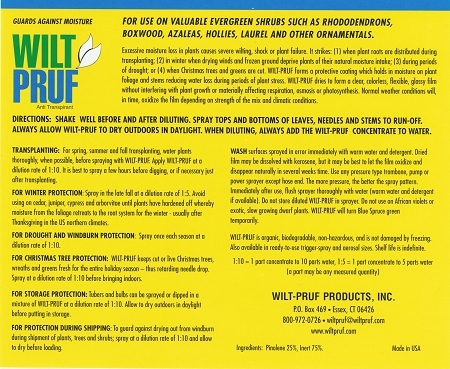 Wilt-Pruf is the most important product I have purchased for my roses this year. It saves them from the effect of heat and allows cuttings and newly planted suckers to have the best chance to survive and grow. It also helps young plants become ground-ready quicker since they suffer no set back caused by wilting. It will also protect my rhododendrons from thermal and wind damage. Great Product.I have shared the information with members from two local rose societies that I belong to. There will be other orders, I'm certain. I have used this product successfully for years. Great product, good price and on time delivery! I have purchased and used this product in the past and felt it gave my transplanted cedar trees, for wind break use, a much better chance for survival. The 18 inch trees I moved 2 years ago are about 3 foot tall and healthy looking. I think the product makes a difference.